My full Summer Stones collection currently - all 13 of them! The Summer Stones Collection is a kit of 6 stones released on 31st May this year, initially sold as a complete kit but many retailers were prepared to break them up and sell individually. 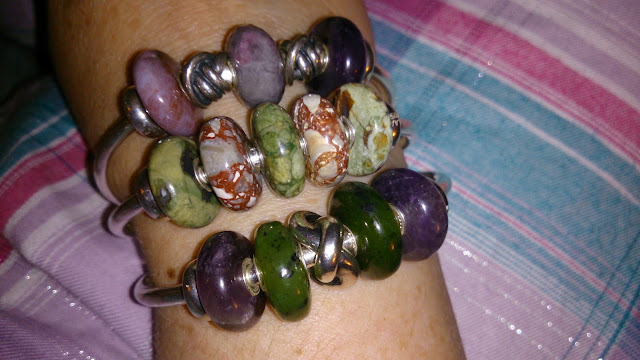 From left to right in the photo above, I have 3 each of the African Amethyst, Canadian Jade and Rhyolite. 2 Red Mud Jaspers, and 1 each of the Dalmatian and Zebra Jaspers. I'd been eagerly awaiting this release ever since Victoria over at Endangered Trolls had first broken the news. So much so that I'd asked Lizzie at Beaverbrooks to see if she could get hold of any for our Trolldate, she could and she did (3 Kits!!) and my first haul included all bar the African Amethysts and the Red Mud Jaspers. 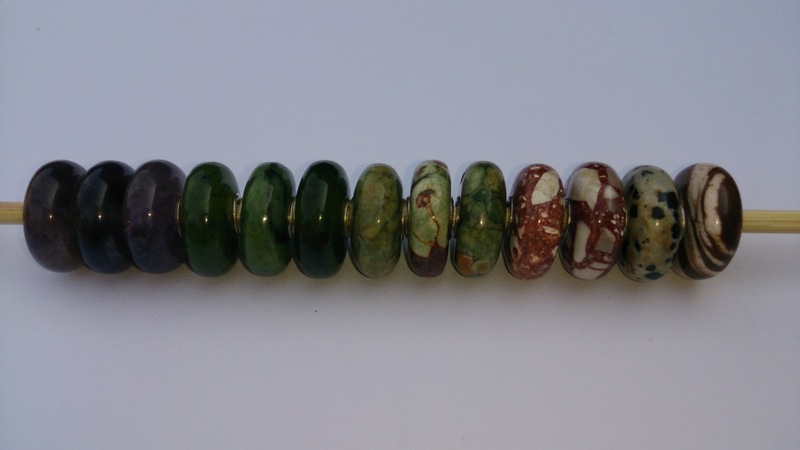 I quickly started to use them in combinations, starting with the 3 Canadian Jades and Rhyolites. Naturally as I'd just got the bangle and was researching for my "Bangle for the Medically Challenged" blog post there were a lot of bangle combos! 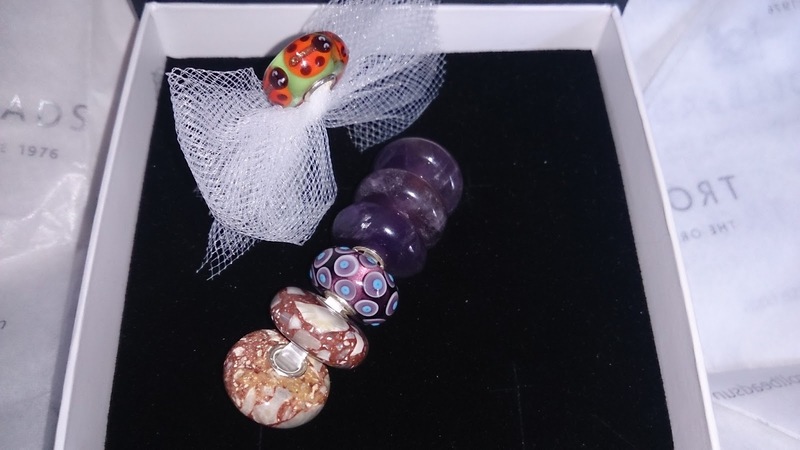 The African Amethysts and Red Mud Jaspers took a little longer to source and came from the US, along with a lovely purple OOAK and my first trollbead critter! They were quickly put to use with more bangle combinations! The other 2 stones in the first bangle are a Jasper on the bottom, and Ruby Rock in the middle. 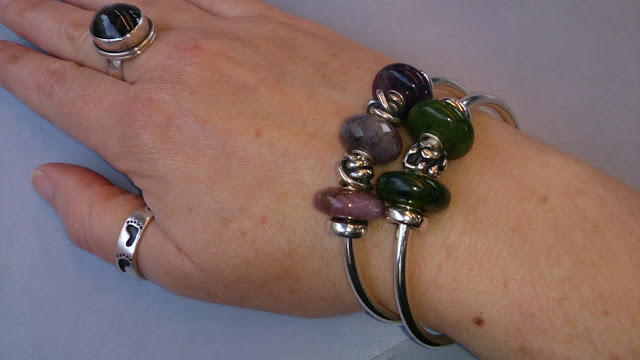 I don't wear all 3 at once but until last weekend these were my 3 made up bangles, shown together just for ease of taking a photo! 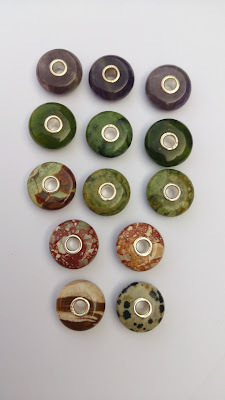 The photo below is the one I'm really pleased with as the light yesterday was just right to show you some of the lovely variations within these stones, did I mention I *really* love this collection? For those of you who like them (as do I) here are the side shots of all the stones, please excuse the untidy composition of the photo... with my phone camera it's been incredibly hard to capture just how beautiful these are and I hit a sweet spot during the weekend where I got off 2 or 3 great shots that show this - I did try for "tidier" photos later on but the end result was just not as good. I need to use what photos I have so far... or I'll be blogging this kit just in time for Christmas! The 3 African Amethysts I have can look everything from dark purple to the palest of the purples depending on the light... these really are the same stones in the photo below! I'd asked for dark examples but with lots of inclusions/cloudiness all the way around the bead so when the strong sunlight hits them they look very very pale. The reason I asked for this is the other amethysts I'd seen all had the natural inclusions, but where it was the odd spot on the bead, in my eyes, it looked more like a flaw. However, all over the bead, in my eyes, it shows the variety and beauty in the stone. 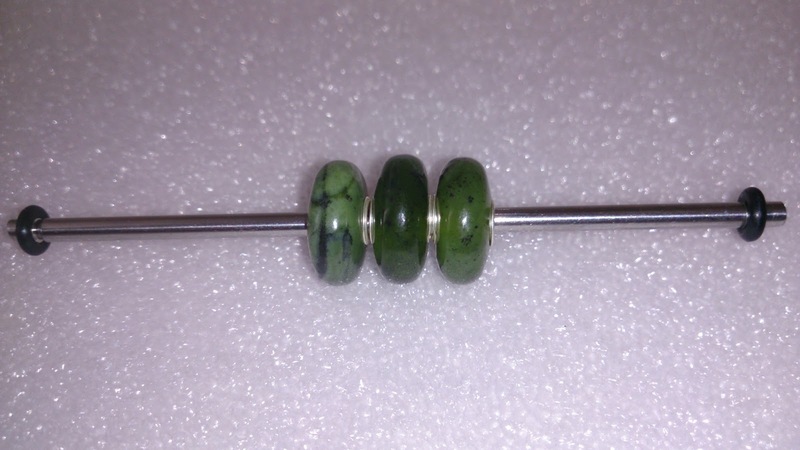 The Canadian Jades are the other translucent bead where appearance is affected by the light, although not as strongly as the amethysts, I have one Jade that is far more milky in appearance and it's just stunning, you can see the difference best in the photo below. whereas the other two are translucent but slightly different shades of green. I adore the variety in the Rhyolites and Red Mud Jaspers both of which are very striking, I've also been exceptionally lucky that I've had such great examples of these beads to choose from. Although to be honest I don't think I've seen a Rhyolite stone that I haven't liked yet; with the Red Mud Jaspers I opted for the chunky, starkly contrasted versions, rather than the smoother more subtle terracotta shades that flow from one shade/shape to another. 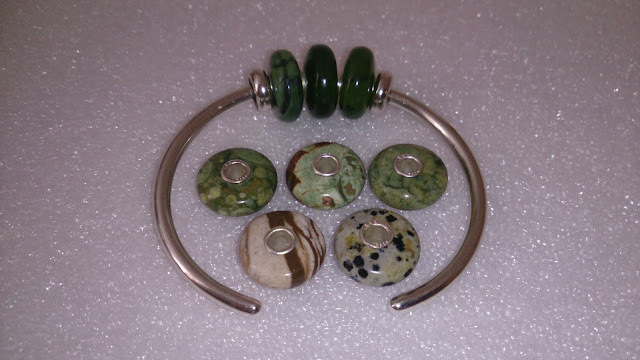 The Zebra and Dalmatian Jaspers are the two beads I only have 1 of. It's not that I don't like them (or clearly I wouldn't have bought any) but more that I saw amazing versions of the others that I really wanted and chose the ones I thought I would get the most use out of - plus, as usual, it also came down to budget... in that I couldn't have 3 of everything!! 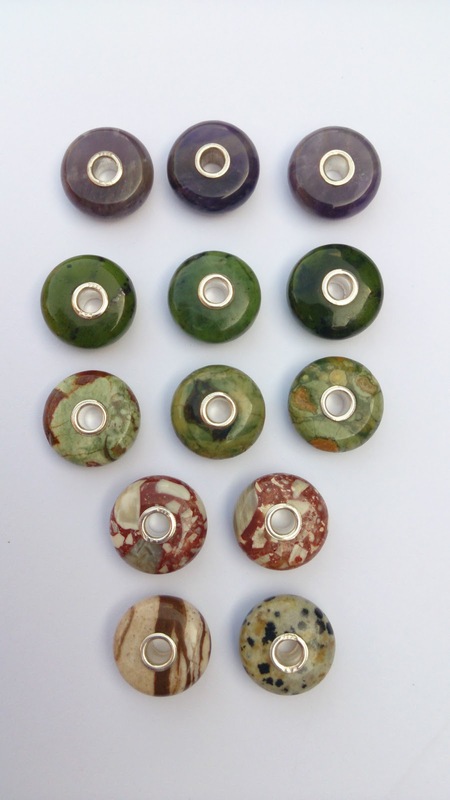 I have since seen some stunning dark chocolate versions of the Zebra Jasper and think I may need to swap mine or at least buy one of those later on if they're still available. For anyone who hasn't yet indulged in the Summer Stones, they were incredibly popular with collectors and created quite a buzz in the community, if you haven't found your beads yet, but see one you like then my advice would be grab it now as these were Limited or Special Edition (that's not to say they won't reappear again in some future incarnation, however there are no guarantees they'll still be available). Judging by the stock levels on a handful of websites, unsurprisingly it seems the Amethysts were the most popular where retailers were prepared to split the kits. 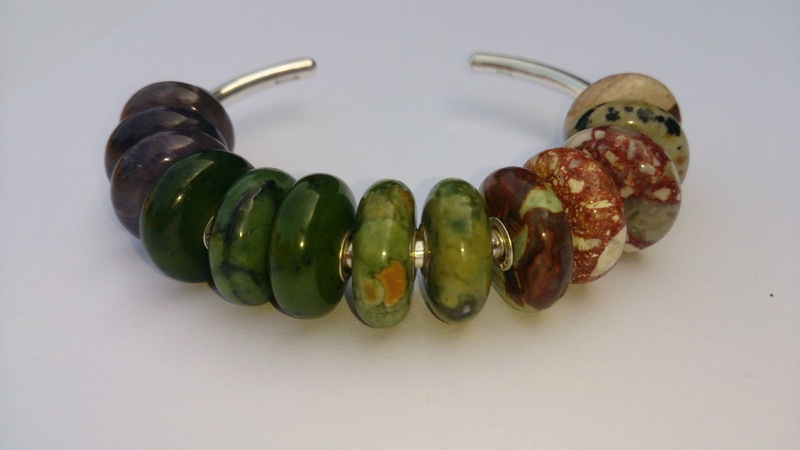 More on those another day but they are beads 2 & 4 on the front bangle with the 3 Rhyolites! Oooooh! You've got some lovely summer stones. 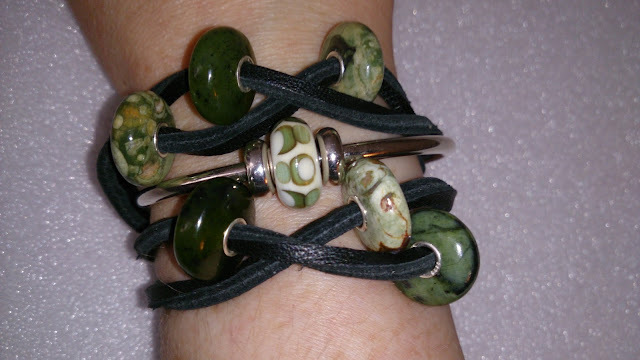 I am very jealous of that really unusual candadian jasper that you've got. I was as smitten as you with the summer stones, so it's nice to see someone else indulging in as many as I did! I must be one of very few people who ended up with an ugly Rhyolite - poor thing is a very nasty shade of orange - think american tan tights colour! 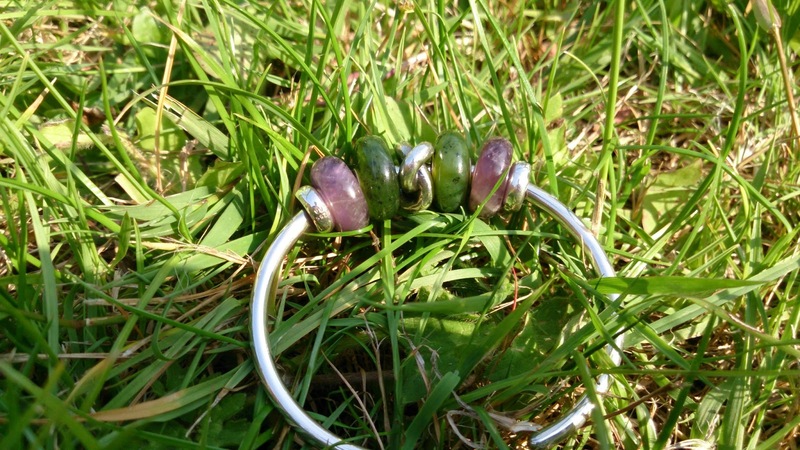 Thanks for all the lovely pics in this article, especially all the bangle designs. 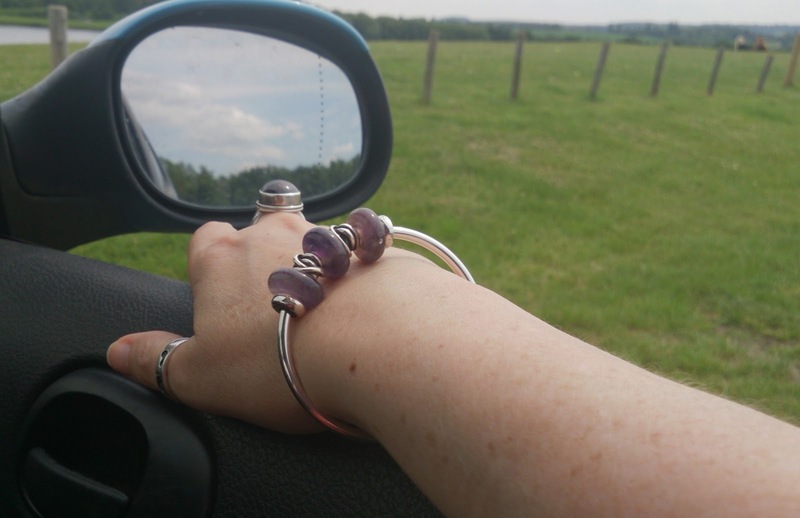 I am still in love with my bangle - definitely a very long honeymoon period. 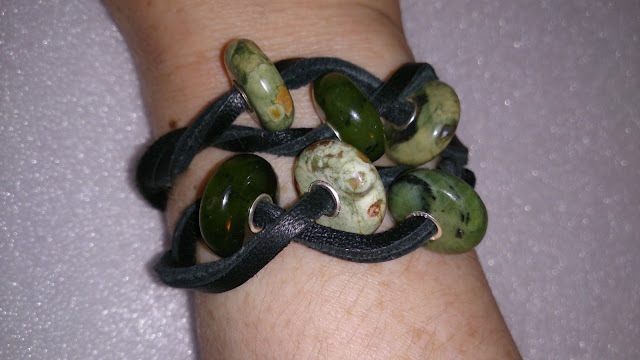 Thanks Debbie, I am definitely smitten, I've practically been wearing nothing but stones on my bangles ever since the release! 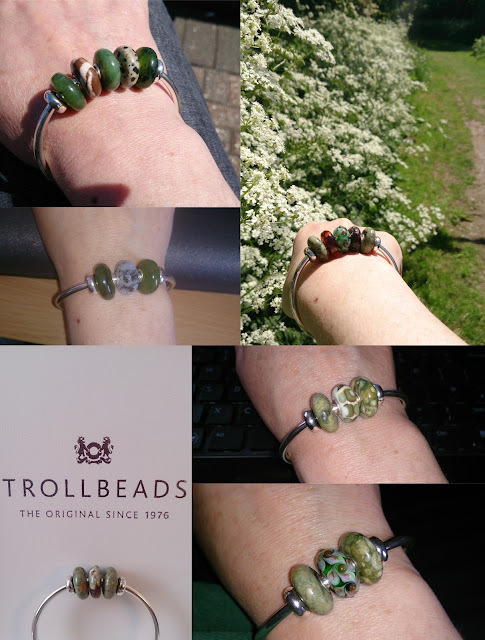 I'm finally getting around to creating a few fuller bracelets now the weather is a bit more changeable. That milky rhyolite is fab isn't it, that was picked up on release day, was so so lucky to find it! Aw your poor ugly rhyolite, you must have one of the rare few! You wait in several years time someone will want that off you for it's rarity!! 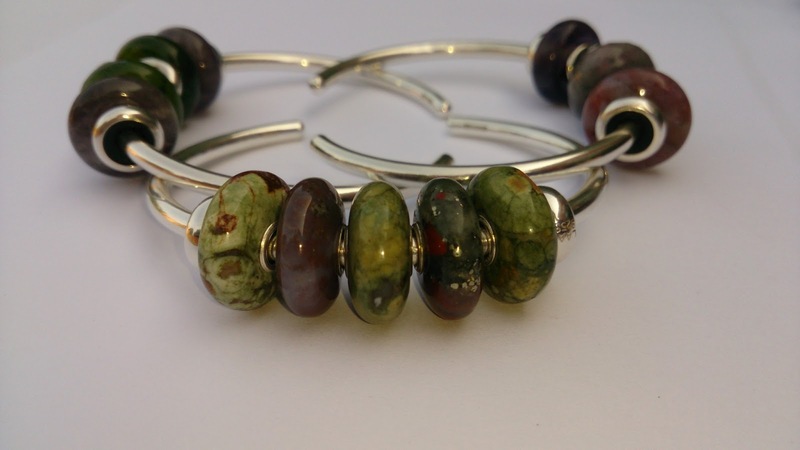 I will be posting some more stones, hopefully tonight but have a new bangle combo to show off later this week!